Do Yourself a Favour and Spruce Up Your LinkedIn Summary! One often neglected section of a LinkedIn profile is the summary (background) section. Here's how ought to fill it in. One often neglected section of a LinkedIn profile is the summary (background) section. This is where you can enter a bunch of keywords that recruiters, customers, suppliers will use to search and find your profile. In spite of this, all too often people don’t even bother to fill either section in. Why should you fill it in? For starters, it gives the reader a quick overview of who you are, what you do, what you are looking for and most importantly, what you can do for them. No one is going to scroll down and scrutinise every position you have ever had or take their time to deduce what skills you possess by looking at your groups and associations. You want to start out your summary with who you are and what you do most of the time. Then write what you can do for others and why people would want to engage with you. This is likely to be a list of achievements, and if so make sure you quantify them as much as possible. You want your summary to stand out and the reader to think they need to take action and speak with you pronto. Related: Should You Write a LinkedIn Summary in 1st or 3rd Person? Here’s one from LinkedIn’s European boss, Ariel Eckstein. Here’s one from the LinkedIn boss himself, Jeff Wiener. So what’s specialities all about? 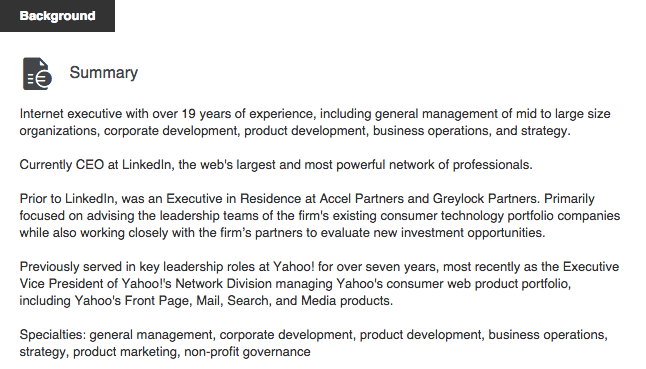 This used to be a box on its own but specialities were moved into the main summary some time ago by LinkedIn. As we can see in the bios above, the specialities is basically a list of keywords strung together for others to find you via the LinkedIn search tool. The keywords can be your past titles, your skills and names of companies, applications, industries, countries etc that you have experience from. It can sometimes be hard to come up with more than 10 keywords so break out your thesaurus and have a look at your co-workers’ profiles and get some ideas. As the title says, please do me this favour and fill these in as you will increase your chances of being found by anyone on LinkedIn. This not only applies to job seekers but to everyone that is open to opportunities in their industry. RELATED: How to Optimise Your LinkedIn Profile for Social Selling.